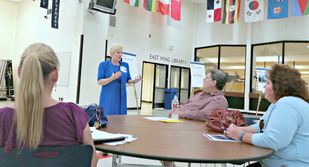 Tuesday, June 27, 4-7 p.m.
Join us to learn more about the 128th Street project and the Swift Green Line. Construction crews have removed hundreds of truck loads of dirt at the Seaway Transit Center site making it level with Seaway Blvd and 75th Street. 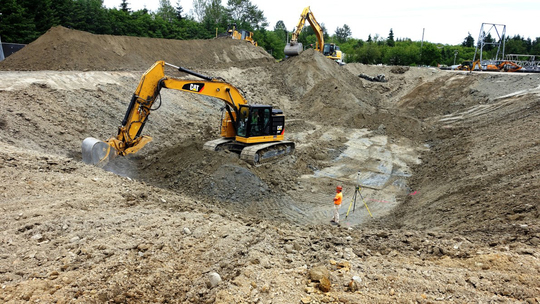 Late June/early July: Excavation of storm water retention vault. Forming foundation of retention vault. July 10: Everett Transit bus stop on south side of 75th will be relocated. See instructions at stop for alternate stop locations. Mid-July: Narrow lanes on 75th Street to begin construction of new turn lane into Seaway Transit Center. 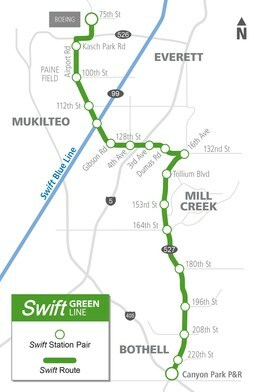 Seaway Transit Center will be the northern terminal for the Swift Green Line, but will also be a regional hub for Paine Field–area transit service when it opens in mid-to-late 2018. The south section of the Mariner Park and Ride is staged for construction. 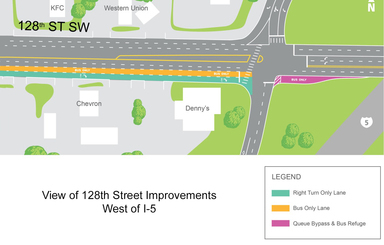 The road-widening project that will create new right-hand lanes on 128th Street at the approach to I-5, one on each side of the freeway in South Everett. These lanes will save buses 3-7 minutes, while also providing a benefit to general purpose traffic. Utility poles have been relocated in front of the Quality Inn on the northeast side of I-5 in South Everett. Lines will be moved to new poles within the next 1-2 weeks. Week of June 26: Construction expected to begin on widening of 128th Street on southwest side of I-5. Traffic may be impacted during this project. Typical lane closures will occur between 8 p.m. – 5 a.m. weeknights and on weekends.